GPS is an enabling technology that does far more than the designers ever dreamed. If you want a quadcopter to fly to a waypoint, GPS does that. If you want directions on your phone, GPS does that. No one in the 70s or 80s could have dreamed this would be possible. GPS, however, doesn’t work too well indoors. This is a problem, because we really don’t know what is possible if we can track an object to within 10cm indoors. Now there’s a module that does just that. It’s the decaWave DWM1000. This module uses an 802.15 radio to track objects to within just a few centimeters of precision. It does this by sending time stamps to and from a set of base stations, or ‘anchors’. The module is also a small, and relatively high bandwidth (110kbps) radio for sensors and Internet of Things things makes it a very interesting part. Some of the potential for this module is obvious: inventory management, and finding the remote and/or car keys. Like a lot of new technology, the most interesting applications are the ones no one has thought of yet. There are undoubtedly a lot of applications of this tech; just about every ball used in sports is bigger than 10cm, and if ESPN ever wanted even more cool visuals, just put one inside. If you’d like to try out this module, decaWave has an eval kit available through distributors for about $600. Somehow, there’s also a Kickstarter for a board that uses the same module, Arduino compatible, of course. Thanks [Roy] for the tip. All these technologies can go to /dev/null. 90s called and want their business model back. Only an open and dirt-cheap standard will succeed and enjoy any significant deployment. Yeah I thought I saw a post several months back about someone building an open source module similar to this. If was even closer to $300. Gah why can’t I find that article? Nah subpos is just yet another rssi based system so it works nicely when you make laboratory tests but at real world situations it is useless. I remember I commented about this somewhere… ah, notes on my Google Plus account from early April. Anyway, they quote up to 6.8Mbps for a peak data rate, and they’re available on Digikey for $32 for the module pictured. The ranging method is built into the updated 802.15.4-2011 UWB standard. This is just the first module you can buy for that. Sounds pretty cool, you have a link for that? It has been a tiresome week here too! yeah, that is why many people are doing research on wifi based positioning. Yes, but all of these research team are well aware of the fact that WiFi with its max bandwidth of ca 40MHz sets a serious limit on the temporal resolution of things (effectively, 1/40MHz = 25ns) and hence, without a lot of additional effort (more antennas, phase-coherent and -calibrated receivers) on spatial resolution (basically, 25ns * 300,000km/s = 25e-9s * 0.3e9m/s = 7.5m). Only direction of arrival, combined with a lot of intelligence, can make that better, and it’s not even respecting anything like noise or the indoor multipath channel, in which you can never tell whether the most of your signal comes directly from the source (quasi Line Of Sight) or is bounced over a conductive surface, or whatever effects lead to it. I am not sure if all, but everything I have seen relies on RSSI. DWM1000 on PCB with antenna, in stock at Digikey, for $32 in single quantity. Not “dirt” cheap, but quite reasonable for a new technology. Datasheets and software, including sample RTLS apps, appear to be downloadable freely with registration (though I haven’t registered, so I’m not 100% positive on that). 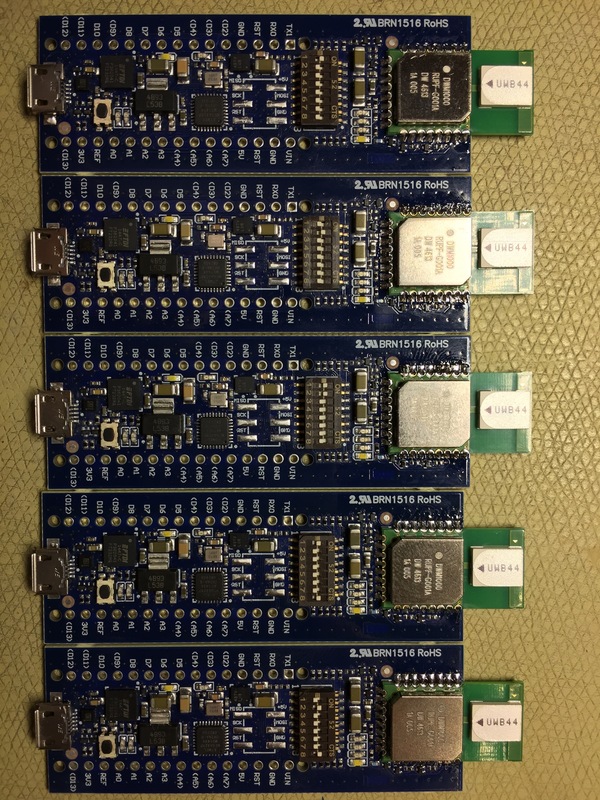 So you should be able to quickly and easily roll your own RTLS system using the $32 version, without buying an expensive devkit; especially if you omit the supplemental sensors (accelerometers, gyros, magnetometers) and sensor fusion code. And it *is* based on an open standard, IEEE802.15.4-2011 UWB. The only parts of decaWave’s implementation that are subject to patent relate to their own silicon size and power optimizations, not functionality. So eventually there will be competition, and the price will go down. Way down once we start seeing Chinese chipsets. The DWM1000 has “6 frequency bands supported with centre frequencies from 3.5 GHz to 6.5 GHz”. But is this ultra-wideband approach in this frequency range going to fit into the RF spectrum allocation regulatory system, eg. FCC part 15 for a consumer product for unlicensed use, as well as the regulatory system in different countries? Aside from 5.8 GHz, there are no ISM bands within that range. An online calculator tells me that -41.3 dBm/MHz is equivalent to only 0.00007mW/Mhz! That is such an *incredibly* small amount of power, I assume it’s beneath even the background noise floor of any traditional narrowband receiver. The transmit power for the DWM1000 is programmable from -35 dBm/MHz to -62 dBm/MHz. So it can be operated within FCC regulations, and without license. The little bit of extra power available above the FCC limit is probably to compensate for lossy PCBs/antennas, they only care about actual radiated power. I can’t comment on regulations in other countries, but I don’t see any reason they should be significantly different, given the unique nature of UWB. And what, dear RiccoElectrico, entitles you to that opinion? The fact that in the 90s, engineers had to be paid for what they developed? Hasn’t changed. The fact that getting a product out there costs serious money, not only in design, but also in manufacturing, sales negotiations, license fees, marketing costs? Hasn’t changed. The fact that silicon doesn’t come for free, and neither does fab time? Hasn’t changed. The only thing that has changed is that, a) your average technological product today is built atop a reference circuit for a chip that is built in billions, so cost is low and b) the innovation depth of “nearly free” products is often not very high. And of course, c) people, who don’t rely on being paid by the company that employs them as engineers think they deserve cheap components. Seriously, this is emerging technology. As much as you wish, unless the company behind it is really really big and willing to take a risk (which, for good reasons, is most of the time frowned upon nowadays) you can’t expect dumping prices on new hardware. This isn’t your average “let’s produce another ARM cortex, and hit the market with 5$ eval boards”; this is application specific, home-grown, medium volume, high-investment risk hardware and someone will have to pay for this. so: 32$ is cheap, and everyone knowing the least about the technology involved will acknowledge that. Also, 32$ is cheap, and everyone that has the least bit of imagination can find a lot of uses for this, even if it costed 200$ a piece, so even the simples market considerations can’t justify a price lower than this. I usually don’t read long texts but this was funny, entertaining and true. Source: I not nothing about anything. I agree with several of the bloggers points, especially the “lack of documentation”, I think I could write decent (enough) docs/man pages for some programs, but to get the coder to sit down and explain it is difficult, if for no other reason that they have moved on to their next project. Hmmm… How about one accurate to 1m and small and cheap enough to fit on a convention badge? If you don’t mind investing in some infrastructure, you can get away with passive UHF RFID for that kind of accuracy. Checkout the Impinj xArray. It keeps the end devices dirt cheap, but costs a bit to deploy sadly. Doesn’t BLE already do this with beacons? Why do you need to go all “exotic” with UWB? A BLE beacon can just find whether is in range, and having small range when it’s in range it’s “near”. To get 3d location you would still need 4 broadcasting radios. I am blind. I see the resolution (<20cm) but I can't find the range. Anyone else have better reading skills than me? Up to 300m line-of-sight (no walls or other obstacles in the way). Same as Chris, with the added capabilities of seeing through transparent obstacles. If the government wants to know where you are and where you have been, GPS does that. Or that black SUV you’ve been seeing for the past few days. So that GoPro drone that follows 10 feet above, 5 feet to the left and about 2 feet behind and films everything you do? Done. Selfie sticks just got a whole lot more interesting. Not exactly. You still need multiple stations to determine position and orientation. However, since the positioning is based off a timed sequence (or accurate time stamps synched across the array) things getting in the way will not make your drone veer sharply to the left because that side’s signal suddenly got a lot weaker. I wonder whether this could be used as a delta distance, between two nodes (ie. person and quadcopter) and have the orientation computed out of the ARHS and magnetometer readings at both partners – thus not providing absolute position, just relative. Actually, that doesn’t sound like a bad idea. Mind if I steal that from you for a drone beacon circling idea? A plane or quadcopter (whichever style is more appropriate for your needs) would fly in a pattern, keeping a constant distance or position and recording an area / doing something remotely / functioning as an amplifying antenna. It could carry and drop beacons, or they could be pre-set. Not just handy indoors – my (commercially bought) robot lawnmower could benefit from this. Currently it just does a random walk, but sticking these at the corners of the yard would let it mow nice straight lines. Other benefits: plan its trip more efficiently, find its way back to the charger more efficiently (both mean can mow longer and leave less ‘reserve’ for finding its way back to the charger), and learn to avoid that one place where it keeps getting stuck. Same goes with Roombas, I guess, though I don’t have on so I don’t know how they navigate. I guess the cat on top may interfere with the signals. And the shark costume the cat is wearing isn’t any help either. Looks like they are still doing positioning based on ye olde, aggregate data on the server side and calculate your position approach, rather than on the client side. So for the client device that wants to know its position, you would still need a data connection to a server somewhere. Very novel though. I’d like to see someone hack away at them to see what they are capable of and if you can reverse them somehow (put “tags” all around the place and use an “anchor” as a receiver). Based on that information, you would need to transmit the location or distances to the client for it to determine its position. I.e., the client isn’t purely a passive device like GPS. ” just about every ball used in sports is bigger than 10cm” where do you come up with this junk. Hockey balls, golf balls, tennis balls, table tennis balls, rounders balls, cricket balls, base balls. Balls balls balls and all less than 10cm. It seems you need to sync a 84Mhz between all anchors . But how do you synchronize the clock for the fixed anchors ? * Round trip mode: here you measure a round trip delay to each base station, so the clock can be separate and unsynced. Talking about cheap… why not create “fake gps satelites” indoor? if gps does not breaks through walls, and this system i see does not also, as 300meters with clear line of sight can be less then wifi range… Why not emulate a gps satelite coordinate system with the correct values indoor? and you get it working out of the box, with the same technology.. I bet harware cost will be way low, 50$ at max, so let the brain storm..
It’s the regulatory cost associated with transmitting on GPS frequency that’s the problem (this is why GPS repeaters are expensive). Hence why most things only use the ISM bands. They are free to transmit on with certain EIRP values (dpending on the country). By the way, check out my project (click the link on my nick). I provide a solution to what you propose. And what precision can you obtain in outdoor based on 4 anchors ? At the moment with the default “standard”, you get about 1-1.5m of accuracy (depending on how far apart they are place and their tx power; a side effect of RSSI having such low precision). I am currently developing two additional methods (you can optionally enabled them), to increase accuracy further. I have the hardware developed and the software is complete for the transmitters, I just need to update the Android receiver API to utilise this. I will have an updated video in a few weeks with it all working (busy with work and uni this next week). Because GPS clock generation requires cesium atomic clock (in the satellites) to be as accurate as needed… so this would’nt be “cheap” at all. Why there’s people here whining about how “not cheap” this is? Your average Arduino-brand board costs 25 €, the average GSM Board costs around 35 €. And I’m talking about damn old stuff. Go support the new technology, people. Did you miss above line? article is about this..
Do you borrow me $600? Evaluation kits are always way more expensive than the product itself. As it was stated earlier modules are available T $32 (probably less in quantity), if you just want to “play around” with for hobby purposes, you should be able to do that with a module or 4.. sure not china-bay cheap, but not excessively expensive either. That kind of evaluation kits are made for companies, who wish to use the product and need a platform where they can easily test the product and software for it. The time saved by not having to design PSU, processor, communication and software around the chip is worth way more than $600. The pozyx kickstarter project looks interesting, but crazy expensive. These are all based on the decawave modules which are actually only around $30 each. the pozyx kickstarter actually gives you a full system of 4 anchors and a tag for 449€. So you already need 5 UWB modules for that. On top of that it has other sensors and a powerful microcontroller. I wouldn’t call it crazy expensive.. 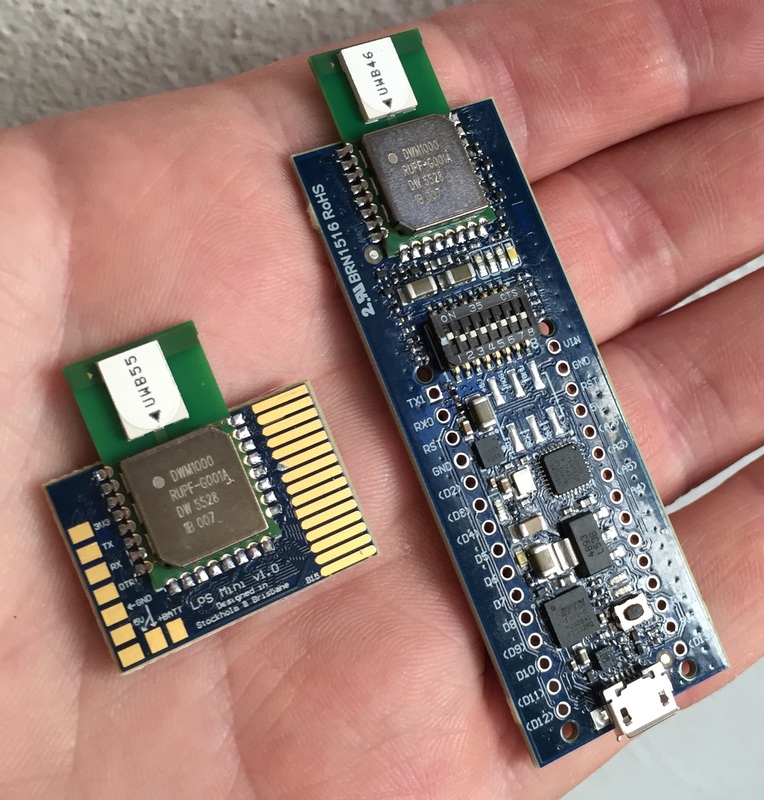 The evaluation kit of decawave is 600$ for only two modules, so you can’t even do positioning with that..
As it’s not an open source project and a commercial one , it’s seems decent to me. But the same could be probably obtained for 200$ with a 25$ price for the module. And , according to me , a decent uC , is only needed where trilateration / fusion is used, and low cost arduino / uc can be used on fixed anchors. The $600 is for the developer kit. The modules are $25-$30. If i’m following the github info correctly it only needs arduino. Does anyone know of any implementations of indoor positioning that does not require line of sight? I’m guessing that many of these systems that use RSSI don’t work without line of sight because of obstacles that attenuate the signal and therefore the recieved signal strength is lower and the perceived distance is predicted to be further than it actually is? A possible solution might be to use the time of the arrival of the radio signal instead, although that would require precise timing instrumentation. I have a feeling that this type of technology will gain a lot of traction soon, when the main problems are addressed and when it becomes affordable. The applications might not seem apparent immediately, but there are some cases where indoor tracking is desired. Some examples are: For automated robotics in your house to be aware of which room it is in, so that it can avoid rooms it’s already visited or even stay away from “no-noise zones” that you can specify. In a warehouse forklifts (possibly automated ones) can be aware of each other’s position and can each choose a optimal path without congestion. No positioning system will work 100% reliably without line of sight, unless you accurately model the environment and control everything in it (people moving for example). Reflections and absorption will always be a killer, but you can use averaging (median filters), diversity and aggregation of different positioning methods to reduce the error as low as possible. I guess that means that the positioning system will need to be adapted for each use case? So if you were to use it on a robot vacuum cleaner like a roomba, would it be possible to reduce error by dead reckoning? Is it possible to also use a computational solution such as mapping out the entire indoor environment? Not really, as long as it’s “good enough” for most use cases. For things like the Roomba, you can use courser positioning for moving about and you would use additional sensors to create finer grain control (i.e. not running into things and docking). In terms of using dead reckoning, you could use that in combination with the positioning system make predictions if you like, but it would be more for path finding logic, rather than positioning itself. Thanks for your interest in Decawave Technology! – I confirm that the max data rate is 6.8Mbps. – $32 is for the module and for a unit price. – The underlying chip, DW1000, is using standard CMOS technology like any other RF chip and thus fairly cheap in volume. Correct. You need a minimum of 3 anchors and once the module on the mower has measured the distance to each anchor you simply need to apply a trilateration scheme to determine the position. If the 10cm precision is real , it could be the best technology to use for this application over good GPS + sensor fusion ! Our evaluation kit – TREK1000- gives a 2D accuracy of 15cm… RAW. With a bit of filtering/averaging you can get to the 10cm. And some of our customers even get down to 2cm using data from an inertial measurement unit. 10cm is a bit much for my application, but I’m wondering if any averaging techniques can be used on low speed objects to bring this down to 2cm. What is the limit to precision? Processor speed? The limit of the precision is the bandwidth of the signal. The larger the bandwidth, the better the accuracy. Our chip has 500Mhz/1Ghz of bandwidth. In comparison, latest Wifi chips using Time of Flight (like our technology) have a bandwidth of 80Mhz. This is why their accuracy is only 2 to 3 meters. The drawback is that the larger the bandwidth the higher the power consumption. Our technology is an impulse radio so the power consumption remains really low. But for technologies like Wifi, a very large bandwidth would imply a very high power consumption. Note that current tWifi/BT/BLE embedded in phones and other devices rely on signal strength (RSSI), not Time of Flight. RSSI is very dependent on the environment and line of sight, this is why it has a poor accuracy in most of the cases. +1, I’m looking at picking up a few bare modules for the exact same thing. I couldn’t get good enough resolution/locking with RTKlib GPS in a rover/base station setup, this looks like it could be slick for a relatively small yard. I see lots of talk here, but I wonder why people are so interested, you don’t really need this kind of thing for a residential home do you? So are you people all managers of large complexes? Because I don’t see this be useful for the normal home tinkerer. If you need to simply know in what room in your house you are there are simpler methods. For a robot mower for example : instead of randomly mows the lawn , you can use such a system and map your garden to optimize mowing ! Or, you could save a lot of trouble and money and get some vitamin D in the bargain by pushing a cheap mower around. •I• want an accurate positioning system for use in interactive art installations. Future art projects will also involve its little brother: http://www.loligo.se/navigation/LPS_and_LPS_mini_top.jpg. If your still around, do you have a link for these Arduino Nano Clones (BRN1516) ?